Today I'm going to change gears a little and focus on a specific illustration motif rather than a general theme. I was hoping to do a themed post per usual, but the more I looked into it, the more this one style kept popping up, and I found it too intriguing not to explore. 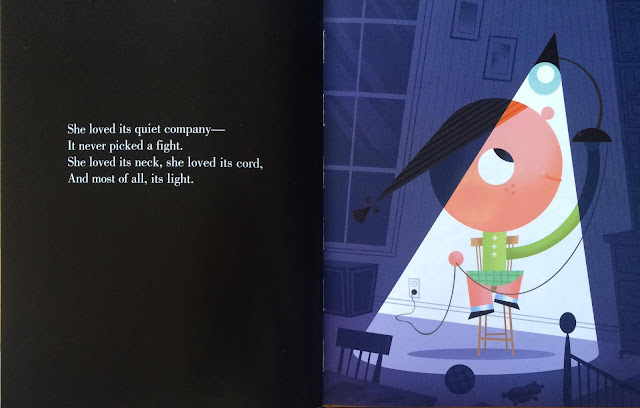 In these illustrations, we see a triangular beam of light from a flashlight, and I've come to find that this style is used purposefully and with a very targeted visual narrative. The beams of light in these illustrations illuminate the scary parts of the night and show us the way to new adventures, but always within a safe space. I say safe space because you'll notice how all these examples showcase light beams that shine to the left. We don't feel a sense of hesitancy or urgency when turning the page, because our eye is being drawn in the other direction: we're focused on what's there and not nervous about what lies ahead. Let's start with Ame Dyckman's and Zachariah OHora's Wolfie the Bunny. OHora uses his beam of light to comically highlight Dot's greatest fear. 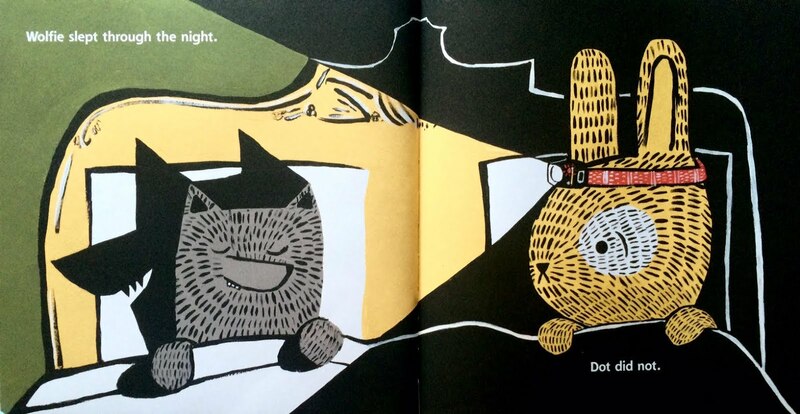 Dot's little headlamp illuminates her bed mate and casts a shadow of Wolfie with giant teeth and a smug smile. The juxtaposition between the sleeping, cartoonish wolf and his shadow is downright comical. We've had several pages worth of Dot acting nervous about her new baby brother, and now we get to see her fear manifest itself in a safe, comical way. 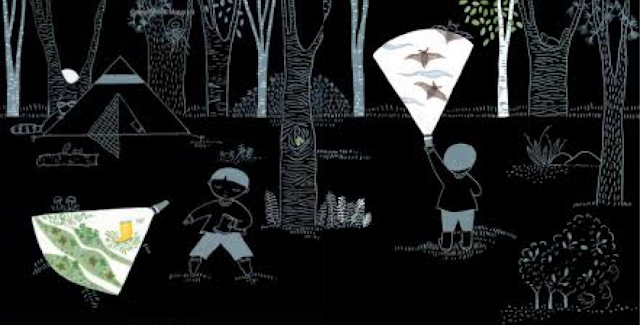 A beam of light can also light the way for adventure, like the illustrations in Joseph Kueffler's Beyond the Pond. Ernest D uses the flashlight to light his way as he play-fights with Big Foot. 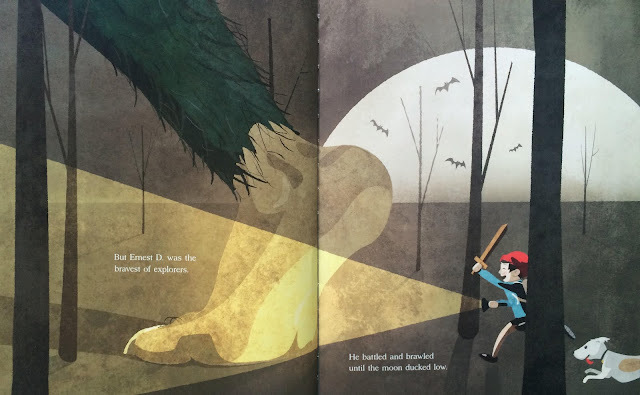 Kueffler uses the flashlight in many of his illustrations, and each instance serves to make us feel safe and aware of our surroundings as we travel on this dark adventure with Ernest. So we have comedy and adventure. But we can't forget one of the most obvious uses for this technique: spotlighting. A harsh, directed light can be used to highlight or introduce a character, like in Bob Staake's Mary Had a Little Lamp. So what happens when we change the direction of the light beam? 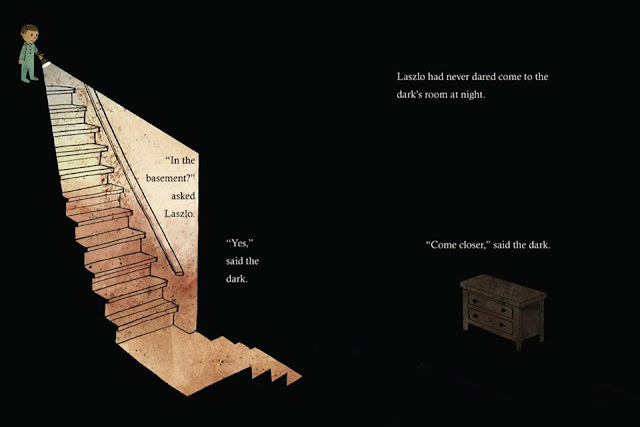 Lizi Boyd's Flashlight and Lemony Snicket's and Jon Klassen's The Dark make whole books out of this style of illustration, and both use the motif to create suspense in their illustrations. 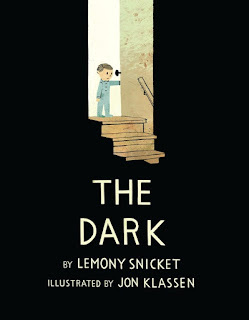 The difference between these two books and the books that just feature one or two illustrations with a light beam is that both of these books use the light beam as an integral part of the whole visual story. The adventure only moves forward based on whatever the light touches. In Flashlight, which is wordless, the light beam colorfully illuminates what the boy finds in the woods around him. In a predominantly black-and-white world, these bits of color serve as the focus of the narrative and carry us through: what will we see next? Will it be scary? 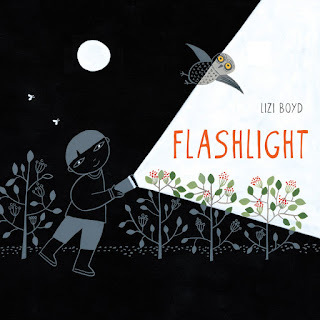 And again, we don't have a textual narrative to alert us to what might be coming next, so all of the interpretations we make are based on what the flashlight illuminates. Jon Klassen does something very similar in The Dark. We can't see beyond the light beam, so, like Laszlo, we are forced to rely on whatever the light shows us in order to move forward. Unlike Flashlight, we have the added text pulling us forward, but we're still in the same situation where we cannot see what lies ahead, especially moving from left to right. These two books essentially become trust exercises. 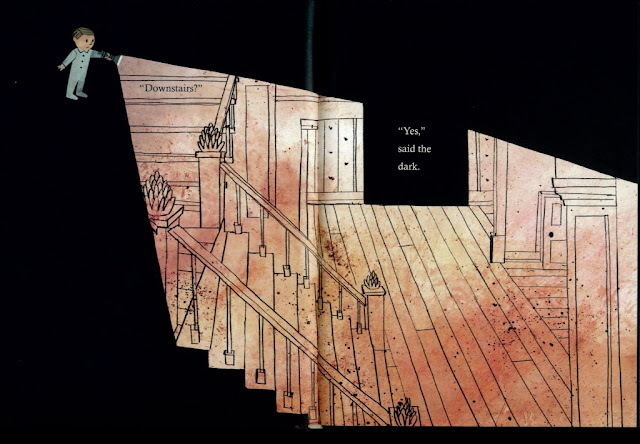 Unlike the light beams we see in Wolfie and the Bunny, Beyond the Pond, and Mary Had a Little Lamp, the light beams in Flashlight and The Dark shine in all different directions. This enhances that sense of urgency and suspense mentioned earlier: what will come next? Will we be able to see it, or will it fall outside of what the light touches? That sense of safety is gone, and we find ourselves at the mercy of trusting the writers and illustrators to safely carry us through the story. It's an interesting motif that I've seen in countless illustrations, and it's been interesting exploring something so niche. I hope you enjoyed this slightly different style of post, and I'd love to hear about any illustration motifs you would like to know more about. It's good to mix things up every now and again! On a separate note, I am BLOWN AWAY by the response I've gotten so far for the LTPB Exchange. If you'd like to join and begin exchanging books across the world with other picture book lovers, sign up today!